It can also diagnose everything from Parkinson's to autism. There's more to your eyesight than just whether or not you can see. Often, your vision can be a window to other health issues, like autism, Parkinson's and even whether you have a concussion. 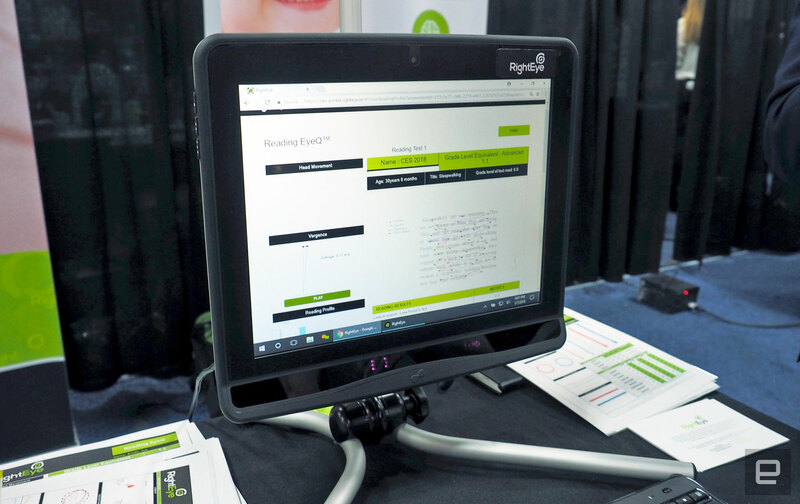 That's the idea behind RightEye's EyeQ system, which aims to revolutionize the optometrist office with eye-tracking tech to not only diagnose issues, but to offer therapeutic measures to correct them, too. This week at CES, the company revealed a brand new all-in-one EyeQ terminal that incorporates a PC, a monitor as well as a Tobii eye-tracking camera that promises to do all of that and more. According to CEO and co-founder Adam Gross, EyeQ has already been in use in schools, certain clinics and hospitals; Major League Baseball is also using the tech to test their athletes. Aside from having a new terminal, RightEye is also introducing a slew of different EyeQ tests that can assess everything from Brain Health to whether or not you have autism. One particularly useful test is called Sports Vision, which can immediately figure out if you're still suffering from concussion symptoms. There's also a Reading Evaluation test that children can take to figure out if their reading problems stem from actual vision issues or if it's more psychological. I sat down to try one of the tests out; it was one that simply asked me to follow a dot around and to shoot spaceships out of the sky. The RightEye spokesperson I talked to said this test was designed to assess reaction times in addition to eye movement. I managed to pass the test with flying colors, though the stark lights in the Unveiled trade show meant the eye tracker didn't react as quickly as it should have. Gross tells me that RightEye already has their legacy systems installed in almost 200 different locations. It hopes to release its newer all-in-one EyeQ terminal next month.